Vol. 2 of The Mount Athos Series by Archimandrite Vasileios- 32 pgs. 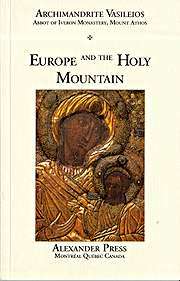 The Mount Athos Series is a collection of essays by Archimandrite Vasileios, Abbot of Iveron Monastery, Mt. Athos. His essays bring to the English-speaking public more of the fresh vision of theology, Church, and the world offered by the Holy Mountain through his original yet genuinely traditional voice.